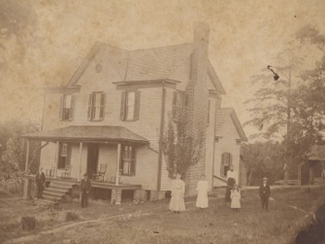 Home of Hobart Garland Ferree, Sr. 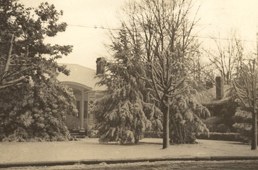 This was the home of Hobart G. Ferree, Sr. and Madge Trogdon Ferree located in High Point, Guilford County, North Carolina. 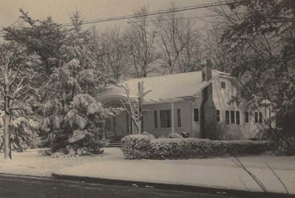 It was also the house where their son, Hobart G. Ferree, Jr., grew up and lived most of his life. Hobart, Jr. purchased (or traded) it from his parents in 1946 and his son, Chris Ferree, spent the first ten years of his life here. Hobart Garland Ferree, Jr., son of Hobart G. Ferree, Sr. and Madge Trogdon, was born January 6, 1921, and died February 26, 2002. Lineage: Hobart G. Ferree, Jr. & Rosemary Regan/Hobart G. Ferree, Sr. & Madge Trogdon/Calvin Madison Ferree & Mary Lamb/Samuel Ferree & Keziah Ann Giles/Joel T. Ferree & Mary Trogdon/Daniel Ferree & Priscilla Ward/Solomon Ferree & Rebecca (? )/John Ferree & Mary Elizabeth Musgrave/Daniel Ferree & Marie Warenbur. Photos and information courtesy of Chris Ferree, grandson of Hobart G. Ferree, Sr.